Things I liked: Light weight accurate and portable. Things I would have changed: Open sight would be nice. But a nice red dot is just fine swivel studs for a sling, I installed my own and works great. What others should know: Keep it clean , very accurate and very powerful. Things I liked: Shoots .45 and semi-compact. Things I would have changed: Fill probe poor design, cheap pins and pot metal trigger. Designed like a $200 dollar paint ball gun. Sorry O rings - broken and one not right size. Poor quality for $600. Hard to believe some give it 5 stars. Guess you have to convince yourselves you got your money worth. I just do not see it on any level. More of a novelty item. What others should know: I have a Ev Sniper also. Some problems there too. Have two other rifles/ other makes and no real problems. Much better to spend your money on something else. What others should know: it's not quiet, it goes BOOM! also has a some recoil. buy one! you'll fall in love with it. Things I liked: Very powerful, nice tight groupings, good balance, loud. Fun to shoot. Things I would have changed: Air filing, get rid of the probe and go with a foster. The tank replace is not easy as you have to remove the scope rail. More shots per fill. I get 3 to 4 good shots in 45. What others should know: Not a backyard air gun. Keep a air tank on hand or a hand pump. I am not a big fan of filling probes wish they would used a foster. But with the short coming it is still a lot of fun to shoot. Yours must be an earlier version. The one I received on 8/18 has a tank that just screws right on or off. Nothing else to remove or tighten. Things I would have changed: I think they should come out with a buttstock for this gun. Things I liked: Balance, looks and accuracy . So far have only shat it at 10 yds. Mine is in 22cal. I havent checked FPS. What others should know: Buy it you ll like it. Except shot count in my case. One last thing. Judging by the marginal increase in fpe between the 250 grain HPs and the 300 grain flat heads, and given the nonlinear drop in velocity between all the pellets i tested and the 300 grains, i think its reasonable to conclude it is a diameter issue. I now see the 300 grains are .457 diameter, everything else was .454 diameter. Conclusion: stick to .454 diameter pellets in the evanix rex p.
More thoughts after having the gun for a while. I don't like how exposed the mechanical moving parts are on the bottom of the gun. A gust of dusty wind could get some grit in there. I recommend lubricating the ball bearing that holds the cocking lever in the closed position. Mine got dry and wasn't readily receding into the lever when closing the action, causing rubbing on the frame part it folds into. This led to the lever being ever so slightly looser than it normally would be. Prevented the problem from worsening by lubricating it. Periodically tighten the spring loaded safety catch on the cocking lever, it will get loose easily. When shooting, leave the fill probe in the gun, and connect/disconnect your air hose to the fill probe's quick disconnect instead. pulling it out only to put it in again every 2-3 shots will put accelerated wear on the fill probe's o-rings. I like the 250 grain hollow points best. Things I liked: seems to shoot straight, not for your city back yard, it is kind of loud in .45 cal. What others should know: this gun will shoot .45 projectiles so if you want to use cheaper ammo, 200 gr, copper plated bullets will work. i can't say anything about barrel wear, that will be up to the user. Hi, I bought the Wolf silencer for my 9mm/ 0.357 cal Rex pistol and telling the truth it work. Not super silenced, but work. Mine had baffles inside. DO NOT BUY WOLF AIRGUNS SILENCER!!!!!! I purchased this and it did nothing except 4db drop. Gun still was very loud. Tried to contact them and they never responded back. They were GREAT in returning my emails up to the sale. Afterwards-----nothing. I contacted PayPal and filed a claim. Sent the silencer back and PayPal refunded me. I kept searching and found silencers made by Neil Claque. I bought from him and it did it exactly what I wanted/needed. My rainstorm 3D is now quiet! Do a google search and you will find his products work. Only downfall: I had to wait 4 weeks for it. I just purchased the evanix tactical sniper .50 cal and I will be ordering another silencer from Neil for this one. Regardless of the wait. Because I know it works. Just ordered 9mm (.357), waiting now. Thanks so much for the information on Wolf Silencer. They want $95.00. If it is difficult to take tube off, why buy extra tanks, there must be an easy way to do it? I bought the Evanix .357 pistol and can't get the air cylinder off. The manual shows it twist off counter clockwise. How did you get the tank off? 2nd week with the REX P 9mm. The more I shoot it the more I like it. The trigger feels real good after lightly adjusting Hex Screw 1/2 a turn. You dont have to worry about the REX being too loud. Wolf Airguns has the answer. Things I liked: Powerful, accurate, superb quality, easy and lightweight to carry. 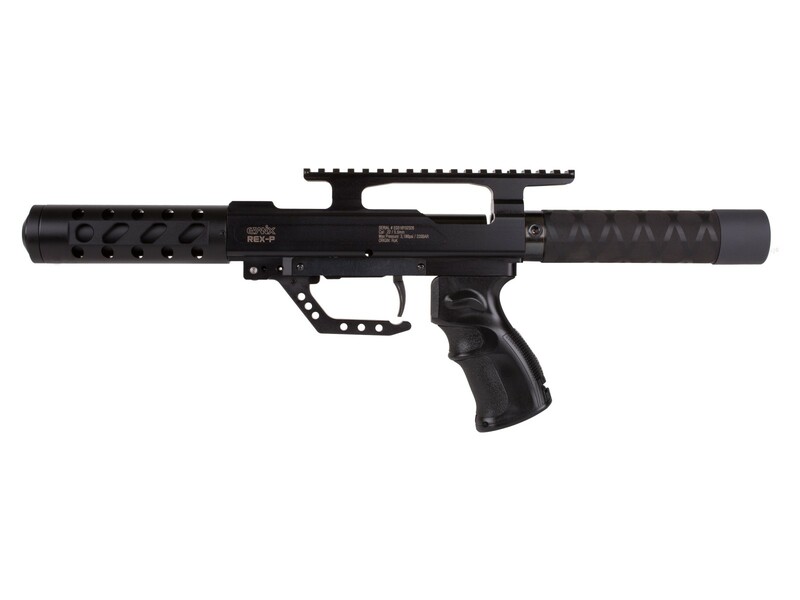 What others should know: This air pistol is very loud but has a brute feeling when firing it. I would not trade the quality for a lower price. Things I liked: I Love this Rex but it came with no instructions on how to put the air in. Things I would have changed: I would add at least a 5 round clip then it would be awesome for that price. Problem with the Evanix rotary clips in both the 9mm and .45 versions is that those clips are too narrow. I'm not about to spend that kind of money for an air pistol / rifle who's clip will hold nothing heavier than a 100gr pellet . To me that makes the gun just another "plinker" and I already have several of those. Make the magazine wide enough to accommodate the 145gr Nosler Ballistic Tip in the 9mm for example and NOW we can go hunt. Evanix does make a multi-shot pistol. It's not great looking but it is powerful. The problem with powerful pistols is that you get a tiny shot count. How loud is this pistol compared to a .22 Marauder rifle? The specs say "high"'. Is it? You can never tell from videos. Thanks! Please make this multi-shot with iron sights and air tank under barrel to reduce length. I agree. Someone needs to make a great looking high powered multi shot pistol. Light in weight and concealable. Even if its just a derringer style.. Its time.